I'm opening this review differently than usual, by explaining why I almost didn't read the book. It helps a lot in explaining why I'm glad I did read it. I love classic monsters. Yes, myths like monsters evolve over time. It's possible to track changes in culture and causes of social unrest by studying the evolution of monster myths. I get that. But when I pick up a book I want to escape from, not immerse myself deeper in, the world around me. Exploring humanity through the story is fine, but please leave out individual angst and social commentary. Give me classic monsters. Zombie myths have evolved less in recent years than others monsters, especially vampires. The cause of the zombie virus and the speed of the zombies are the two main areas where authors debate and strive to forge new ground. They're also the two details I care about least as a reader. Authors can take gross liberties in those areas and I don't care. I'll read on. As long as zombies are zombies, I'm happy. 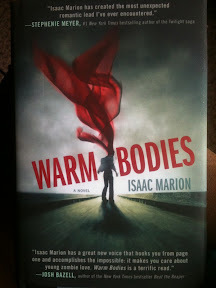 A while ago, someone handed me a copy of Warm Bodies by Isaac Marion. The giver described the book as a great zombie romance, like a zombie version of Twilight. It was an ill chosen phrase to use when speaking to a devotee of classic monsters. I tossed the book aside. Eventually I did pick it up and opened the cover (after brushing off a layer of dust), and began to read. I'm a bibliophile, and I'll give just about any book a chance, a chapter at a time. I'm glad I gave Warm Bodies a chance. It's a great book, one that stands on its own. It doesn't need to be compared to another franchise. Once I started reading Warm Bodies I couldn't put it down. The zombies are everything I could ask for, and not just at the bone-chomping throat ripping level. The author uses the monster in a classic way, to explore the truths of what it is to have and lose humanity. 1) Story: R is a zombie, not too far decayed, with the usual zombie need to feed. But R stands out from his fellow zombies, as a protaginist should. He's unusually logacious, uttering phrases that border on whole sentences. He also has within him a spark, resembling humanity, but better defined as a personality. Whatever wiped out the individualism of the others hasn't gotten to R yet. In fact, his personality is getting stronger. R chomps into the brain of a victim one day, Perry, and is flooded with the boy's memories. Pariculary strong are the memories of the Perry's girlfriend, Julie. R realizes that Julie is in the room. Compelled by undefinable feelings, R saves Julie from being eaten. The growing romance between R and Julie is believable because of its timing. R gradually comes back to life as love grows. Its hard to say sometimes if the love drives the life, or vice versa. What is clear is R is special, and his unique qualities make the romance possible. Perry, though dead for most of the book, is a fascinating character. He's like a ghost living inside R. Think about it for a minute – a ghost of the living survives in the mind of a zombie. Like traditional ghosts, Perry can't pass on to an afterlife until he resolves the issues he left behind. He does that through R, letting go of life even as R returns to it. 2) World building: The author doesn't just toss zombies onto the pages. There's a zombie culture, and he gradually pulls the reader into it. Through R's interactions with the other zombies we learn how zombies fall in love....if you can call it that...close enough...and how they marry and are assigned children. There's even a scene at a zombie school, where zombie children learn how to hunt. Done improperly, the world building would seem cartoonish. Marion executes it beautifully. He knows just how much humanity remains in each member of the undead society, and tells the reader in clear, crisp terms. There are different kinds of undead: zombies like R, and Boneys. Don't take your eyes off the Boneys. Watching them you'll learn that there's more than one way to die. Some of the living may already be dead inside...and if that's true, are they really alive? 3) Writing style: Marion's style, more than anything else, kept me reading through the early pages. He knows when to throw in a tongue-in-cheek twist that makes you grin and keeps you reading. If you've read any of my other book reviews you know I always have some kind of critique to make, and this review is not an exception. WARNING: SPOILER AHEAD. SKIP THE REST OF THIS PARAGRAPH IF YOU DON'T WANT THE SPOILER. Marion's excellent use of symbolism falls short right at the end. There's a point past the middle of the book where R sees Julie's home. He notices a yellow wall. All the other walls in the room feature artwork or photographs, but the yellow wall is blank. It's Julie's hope wall, open for future possibilities. So yellow equals hope. Got it? Good. Later on, R and Julie kiss. He comes back to life and her eyes turn yellow. Therefore, Julie and R's love represents hope for all humankind. I get it...every cheesy bit of it. Sigh. Forgive me. I suffer from literary lactose intolerance. So while I was able to swallow the changing eye color bit, it left me with some indigestion. The timing of the event in relation to the story made matters worse. Julie's eyes change color near the end of the book. When the author should be wrapping things up, he introduces new issues. As I read the remaining pages I kept wondering exactly why Julie's eye color changed. What did it mean in terms of the zombie disease? What implications did it have for other possible changes in Julie? Would anyone else's eyes change color? It was cheesy, poorly timed...and completely unnecessary. There are other places in the wrap-up portion where the author could have emphasized the color yellow, like when R's undead female companion notices the sun and takes her first breath. A let down in an otherwise enjoyable story.